Edmund Hoole started making baggage checks in the late 1860s. 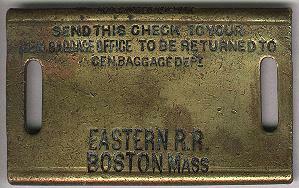 He continued to manufacture baggage checks until his company was absorbed by The American Railway Supply Co. in 1893. It is quite common to see Hoole's patent "OCT 5-58" on checks not necessarily made by Hoole. This patent was for the "Reversible" baggage check. There is an example elsewhere on this sight that shows a matched pair of checks with a Robbins hallmark on one and Hoole's patent on the other. This is also further evidence that the two were in cahoots. During these years of operation there are several know hallmarks for Hoole checks. There is a direct correlation between the hallmarks and the evolution of the company name. 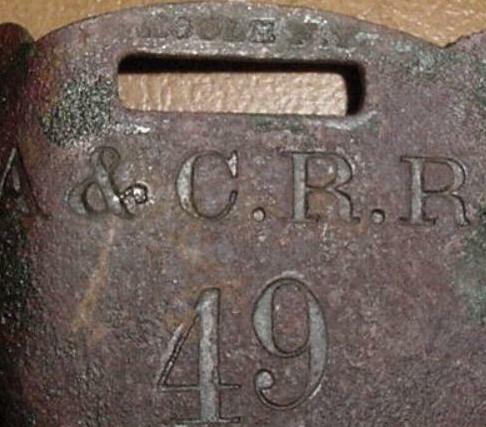 In 1873 the Company name was: The Hoole Baggage Check Company. By the 1880s the Company name was changed to: The Hoole Manufacturing Company. This is a great company to learn from in terms of the evolution of the hallmark they used and the chronology of the company itself. There are documents that exist from 1873 suggesting that Hoole cooperated with the John Robbins Co. of Boston in setting prices. These two companies sent notices to their customers with identical rate increase information. Click here to see some interesting Hoole/Robbins documentation. The following table was compiled from information obtained in the New York City Public Library (5th Ave @ 42nd Street). 1850/1851 Edmund Hoole Residence 179 William St., Business 122 William St.
1859/1860 Edmund Hoole 176 Williams St.
1863-1864 no listing Civil War service? 1865/1866 Edmund Hoole 171 Williams St.
1867 Edmund Hoole 171 Williams St.
1869 Edmund Hoole 75 Mercer St.
1870/1871 Edmund Hoole 75 Mercer St.
1875 Hoole Baggage Check Co. 75 Mercer St.
1883 Hoole Manufacturing Co. 46 Bond St.
1885 Hoole Mfg Co. 46 Bond St.
1894 American Ry Supply successor to Hoole Mfg Co.
Philadelphia & Erie RR Local check. Mt Vernon must have been an early Hoole location. The P&E was a very old road. It's odd to see a Local with a Station designation. This check is an odd-ball. 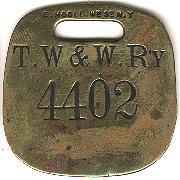 An early Toledo Wabash & Western Railway check. The back has been incised (folk artitized) with the name F.J. SMITH. 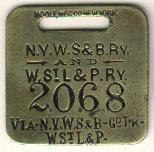 The stretch mark on this tag is because it was recycled after its original use into a device used by trappers to (1) hold the trap spring in place and (2) identify the owner of the trap. 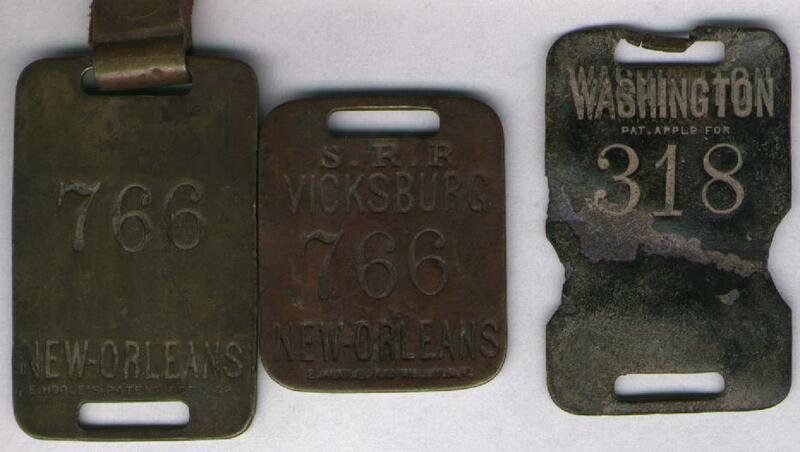 This has been verified by a collector who purchased a string of 5 traps, each of which had a baggage check attached to it. All of the checks that I have with names added to them have stretched out strap slots. 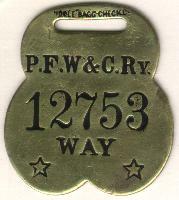 Pittsburgh Fort Wayne & Chicago Railway (Pennsy predecessor) Way check. So much for my theory that Way checks are a later form of the Local check! This is a fabulous shape, in excellent condition. A nice reversible passenger check from the New York West Shore & Buffalo to the Wabash St. Louis and Pacific via the Grand Trunk. 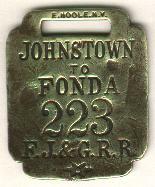 A Fonda Johnstown & Gloversville RR check. You would think that these would be very rare due to the size of the road, however, a number of these have surfaced over the years. The Eastern RR was absorbed by the Boston & Maine RR in 1885. That would make this a very early shell check. The hallmark is enlarged below. Detail of hallmark from top of check. the Alabama & Chattanooga Railroad. It existed from 1868 - 1877. "E. HOOLE 100 WILLIAMS ST." Hallmark & "PAT APPLD FOR"
(on the reverse). This is another indication of age. This is the only hallmark I have for Hoole with 100 Williams St..
crescent cut-outs on the one on the right, it matches the exact size of the one on the left.